Generation WORKS is a dedicated day of service led by women and girls (of course men and boys are welcome too!) with the objective of bringing sustainable change and impact to our neighborhoods. Each year, more than 500 volunteers roll up their sleeves at WORKS sites across Northeast Florida to leave hand prints and heart prints on our community by helping to elevate the work and enhance the lives of those touched by each organization. 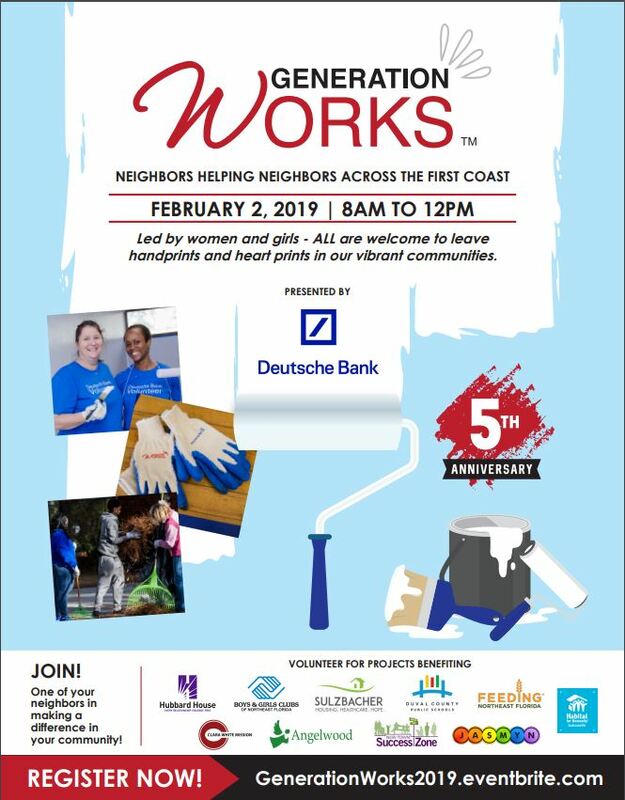 On Saturday, February 2, 2019, the 5th annual Generation WORKS will mobilize volunteers who will wire, weed, wash, and work their magic at local schools, nonprofits, and agencies to transform our communities for the greater good. Paul Davis will work on grounds beautification at Boys and Girls Club of Jacksonville Beach. To sign up visit GenerationWorks2019.eventbrite.com.